EnjoyUp's top-down racer Rock 'N Racing Off Road, released in February, was a disappointing, frustrating experience that left much to be desired. Now, just months later, Rock 'N Racing Off Road DX aims to improve upon the formula and offer a more robust set of features, tracks, cars, and modes. Yet while there's certainly more to see and do in DX, the same frustrating controls will stop most players from experiencing the majority of the new content. 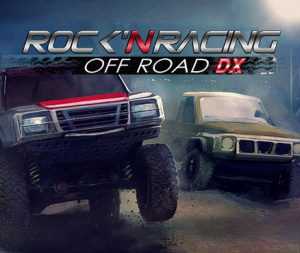 Rock 'N Racing Off Road DX features cup, time trial and multiplayer modes, but by the time players are finished with all the cups they may be soured by the experience and put down the controller. Different cups are unlocked as you play and win, and EnjoyUp has created a variety of new tracks for each cup. Different vehicles are unlocked, as well. 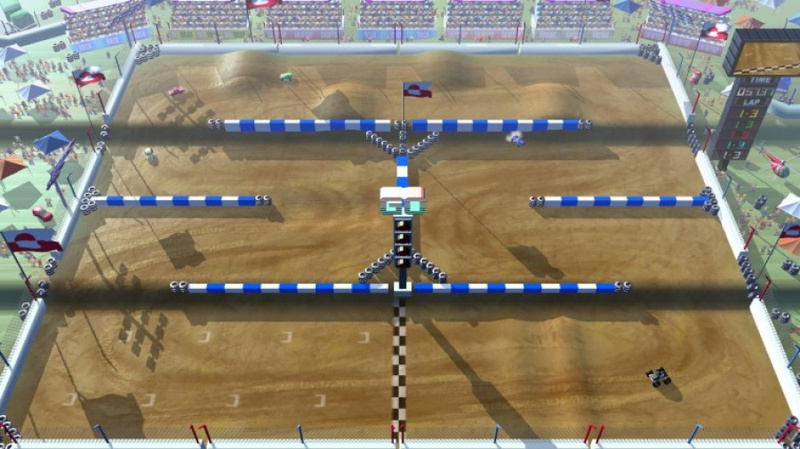 Unfortunately, while there are several new tracks to play, the level design doesn't lend itself to the way the game controls. Controls are again unacceptably loose, with frustrating and punishing physics - trucks move and control like tanks, which is fine, but we often found ourselves fighting this imprecision. The AI is also downright irritating, with trucks performing erratically from moment to moment. Sometimes they'll race past you at the last second, while sometimes they'll hit a wall and stay there; thanks to the difficult-to-navigate tracks, we played through each cup several times before unlocking a new one. Time Trials task the player with recording fast laps - though it's ranked on an online leaderboard, we can't imagine many players participating. Local multiplayer extends the experience a little, meanwhile, with five players (thanks to the GamePad) able to race on one of the four tracks. The game is admittedly more fun in multiplayer, since the crazy AI isn't involved; there's no online multiplayer, but as was the case before this is more suited to playing with friends in the same room, in any case. 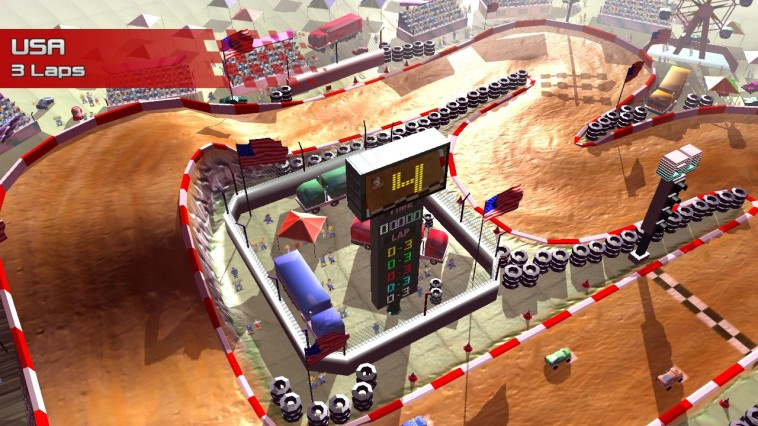 Rock 'N Racing Off Road DX is visually and stylistically identical to the first entry. It's not similar or familiar, it's identical. We actually stopped to see if we'd booted up the first game by accident. The visuals are colourful and the game runs quite well, but there's a lack of variety, with the tracks all sporting similar colour palettes. The generic rock music is tolerable but forgettable, while the announcer says the same imperceptible statements over and over again. There is an off-TV option, which is the only use of the GamePad outside five-player mode. Too bad, I really wanted to like this game. The first one has such terrible controls, would have thought that would be the first thing fixed here. Hopefully they can patch the game, too bad it's more of the same. It's such a simplistic premise, atrociously basic graphics, you'd think the gameplay would be easy to get down - I've both (anything reduced seems to end up being downloaded), just make sure you get the discounted first one to then get 60% off (Europe only I'd imagine), which means both for the same price as buying just the 2nd one on its own. Ah, it looks like a great update to the NES game, but sad the controls are no good. Maybe they'll patch. Hope they do. Shame, I was hoping that they would have added and improved more! I've seen more fun games on Xbone.